We are open Monday through Saturday, 10:00 am until 5:00 pm Eastern, and are closed on Sundays, and major National holidays. For your convenience, many of the items have pre-quoted shipping prices within the Continental US. These prices are only valid for purchases at full price. Additional charges may be incurred for delivery to walk-ups, and may incur additional fees based on flights of stairs, or other delivery restrictions (certificates of insurance, restricted delivery hours, special handling, etc). Please alert us to these types of issues at checkout, and we will contact you to requote costs. If the shipping cost is not available during checkout, submit your order to receive a shipping quote customized to your destination for your approval. You will receive the quote within 24 to 48 hours. If you accept the quote, your order will be confirmed, and the piece will be shipped to you. If you reject the quote, your order will be canceled, and you will not be charged. If you would prefer to arrange your own shipping or pickup, you may indicate this during checkout. White Glove (Full Service): Delivered to room of choice and includes unpacking and removal of packing materials. Installation is not included. Delivery to walk-ups may incur additional fees based on flights of stairs. Allow 4 to 6 weeks for delivery. What happens after I place an order on your website? Once you have placed your online order, look for an e-mail confirmation from sales@jamesandjeffrey.com. If the item can be sent to you by a standard carrier (UPS or FedEx Ground), it will be processed and shipped within two business days of payment confirmation. You will receive a printed invoice by mail. If the item is too large to ship via standard ground and requires shipment by a private, "white glove" carrier, you will be notified by email with the shipper's information so you can contact them for an estimated delivery timeframe, usually between 4 to 6 weeks. Will I receive a written receipt? After you have placed your order, you will see a final receipt with all of the information concerning your purchase. Please print this page for your records. You will also receive an e-mail confirmation of your order within one business day. A copy of your invoice will be mailed. What if I place an order for an item that has already been sold? While we have made every effort to prevent this from happening, the rare occasion may arise that an order is placed for an item that has been sold. In this unlikely event, we will contact you by e-mail, and telephone, within one business day. Your credit card will not be charged. How can I find out about items before they become available on the web site? One of the best ways to have "first dibs" at our latest arrivals is to your name to our email list. Once you have joined, we will send you periodic updates about newly acquired pieces, and particularly pieces that interest you. We have been shipping items around the world for more than 30 years, safely and expeditiously. While almost all of our items arrive without a problem to their final destination, sometimes, accidents do happen. Every piece that is shipped is fully insured. If your item arrives damaged from UPS or FedEx, please DO NOT throw away the box and packing materials. Contact the carrier, and James & Jeffrey Antiques as soon as possible. The shipper will dispatch their representative to inspect the damage. If your piece arrives by private carrier, it is ESSENTIAL that you carefully inspect the piece upon arrival. The driver will ask you to sign that you have approved and accepted the item. Once you have signed for the shipment, the insurance coverage is legally terminated. That's why it is very important that you inspect your items. If something is damaged, please contact James & Jeffrey as soon as possible and we will assist you in filing an insurance claim with the shipper. We cannot accept returns on merchandise that was damaged during shipping. You can check on your order by calling us at 800-991-3499, or sending an email. 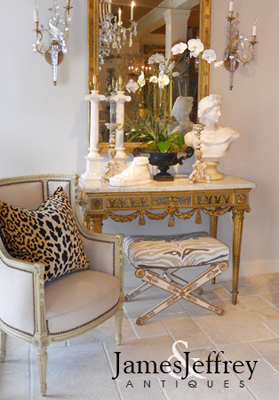 Do you purchase or consign antiques and estates? Yes, we are always buying. If you have one item to sell, or an entire estate, send us an email with some snapshots to info@jamesandjeffrey.com. If your items are what we're presently looking to acquire, you will be contacted right away. We cannot consider items unless you provide an asking price. Please understand that due to the large volume of "for sale" emails we receive, we can only respond if we feel we'll be successful selling your merchandise in our stores. Yes, please contact us to discuss when you will be shopping in one of our stores, or if you are making a purchase online. Do you accept returns for items purchased online? We take great effort in representing our merchandise accurately, but understand that from time to time, an item purchased might not work out as you'd hoped. Returns may be initiated within 3 days of delivery by contacting us by telephone at 800-991-3499 or by email at info@jamesandjeffrey.com. You are responsible for the cost of return shipping. Please note, that we do not subsidize the cost of return shipping, so it may be significantly higher than what was charged to ship the item to you. All returns are subject to a 10% restocking fee. Returned merchandise must be prepaid by buyer, carry insurance with zero deductible, and transported by a shipping vendor approved by seller. Returns are not accepted on merchandise damaged during shipment. Photos of merchandise to be returned are required to verify condition, and must be received by seller prior to the items being shipped. Items must be received by seller within 4 to 6 weeks of delivery to be eligible for refund or store credit. We will notify you, by email, once the returned item has been delivered, inspected, and determined that it is in the same condition as when it was sold. Your refund or store credit will be processed, less 10% restocking fee and the actual costs of initial outbound shipping.